If pressure in venturi of carbs is raising due to boost, so should the pressure in bowl raise. Because if pressure in bowls is lower as it is in venturi, no fuel can be taken into the engine. On the GSXR1100 model 92 with the 40mm carbs you need to fasten the rubber T’s for instance with steel wire to prevent leakage and pressure drop. Pressure below the membrane is needed. On the GSXR1100 model 92 with the 40mm carbs you have a seperate “venting” system with external hoses. Those are not suitable to pressurize. I removed that system, plugged the holes and drilled holes from the bellmouth towards under the diafram. When you drill you cross a not used hole. You have to plug that up also to prevent leakage and pressure drop. So it is made like the earlier models: the 36 and 38 mm CV carbs do not have this system. The pressure of the fuel going to the bowls should be higher than the pressure in the bowl. If not, not any fuel is flowing into the carbs causing starvation as soon as boost starts to build. Therefore you need a pump capable of making enough pressure to overcome boost + 2-3 psi at sufficient amount of fuel. The standard membrane pump on some carb bikes is definitely not up to the job: don’t even try it. An automotive EFI pump coming out of a car with the same amount of horsepower you are aiming for should work allright. If you don’t use a regulator: you will have the maximum pressure on the bowls the pump can handle, and that will be around 90 psi and the end of your carbs. A regulator is used (I use a malpassi and highly recommend it) to give the carbs a 2-3 psi above boost, so difference in pressure between pump and carbs is always the same independent of boost. Make sure you use a bypass type, not a deadend type as it is less accurate. If you can get away with 5 psi on the carbs without leaking, you can use static pressure and don’t need to modify the malpassi. It you have trouble with it, as I have, you need to shorten the spring in the malpassi a bit to achieve 2-3 psi. I also needed a bigger 8mm return line to be less restrictive. Than you definately need the dynamic pressure to prevent starvation under boost! Don’t make holes in the slides bigger, or use soft dynojet springs! They make things worse in the midrange area. Don’t get an A/F any leaner then 12:1 A/F when you use some serious boost. You will burn up some pistons/valves. 11.5:1 is safe imho. Use an A/F meter to see what’s going on. Looking at plugs is not saying too much, because if their getting hotter then normal on a turbocharged motorcycle they are white anyway. Symptoms of lean and rich while driving can sometimes be very similar so in doubt always consult the A/F on a dyno! Because of the lowered fuellevel it is nessecary to give more fuel for the idle, in my case 8 complete turns out for the mixture screws. 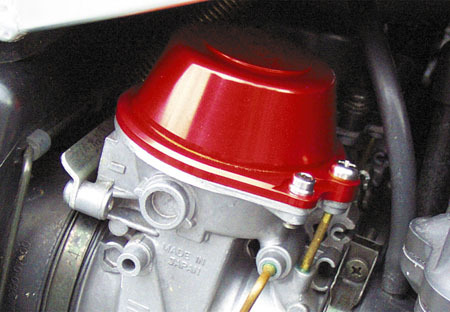 Place a fuelfilter between pump and regulator. Not before pump because you restrict too much, and not after regulator because you messing with pressure which is critical on a carb/turbo setup. Make sure the fuelfilter can hold the pressure! The return line of the regulator should be as less restrictive as possible: inside minimum 6mm returning into TOP of tank, not below fuellevel in tank. Otherwise fuel pressure cannot go as low as 2-3 psi. Don’t ever (I mean ever!) bend this line because fuel pressure can reach scary levels damaging your carbs seriously!!!! Mount a fuelpressure gauge direcly next to the boost gauge so you can easy troubleshoot. Remove later if you want to. If it’s a vacuum operated petcock make sure you use the bypass mode: otherwise on boost the petcock will shut! This is a nice one, as you easily overlook it. On some models the petcock is really restricted in bypass mode so you have to modify that in some way. If carbs overflow: put in new needles and valves. Make sure fuellevel is not too high: pressurized bowls have a slightly higher fuellevel so you maybe have to adjust it a few milimeters. On very high horsepowerlevels there can’t flow enough fuel past the needles. Put in thinner/sharper dynojetneedles to solve this. Typical symptom is a sharp leaning out around peak torque, were you need the most fuel every stroke. This makes it harder to get the midrange ok.
At higher boost you can press out the choke plungers! This causes unwanted rich situations and stalling at closing the throttle. Put in stronger springs to solve. This info is true for my bike and my application. Some of this info is also true on other bikes/carbs but you have to check yourself. If it doesn’t work or you burn your engine up: I don’t accept any claims. If you crash due to an exploding engine: I’m really sorry and I will send flowers to your family but I am not responsible! >> Check out the hints section of www.turbo-bike.com, site has an illustrated guide for “converting” CV’s for turbo use. The small 34mm gsxr750 carbs with alloy throttles and 4 screws on the caps and floats are actually the best you can use when going turbo. A friend (at is cranking out 420 rwhp at 2.2 Bar of boost. I’m also using 34mm carbs on my turbo GSX with alu caps. 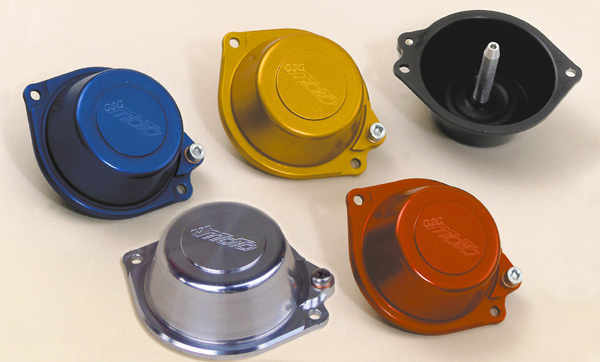 One more tip: Replace the o-rings in the T-s that go to the floatbowls; 9 times out of 10 they are old and brittle and will leak your precious dynamic boost so the motor runs like a pig at the transit from vaccuum to boost. One important thing that I noticed during dyno-testing is that you (usually) start with std. mains, then lean it out a bit. If you go down-or upsize the mains, they have a bigger effect on fuelling than it would on an NA engine. So where you would normally say take it 3 sizes down at a time, you need to take one size at at time with this setup. Tagged CV Carbs set up, Tuning, Turbo. Bookmark the permalink.